New Orleans police officers responding to a suicide attempt call Friday night were fired upon and one was struck. He was released from the hospital on Saturday, police said. The NOPD officer struck during a shootout that killed one suspect in the 2300 block of Orleans Avenue Friday night has been released from the hospital, police said. The unnamed officer, who joined the New Orleans police force in 2017, is recovering at home after being hospitalized following the shooting. He was shot twice in the chest while wearing a bulletproof vest and suffered bruising and slight bleeding, police said. 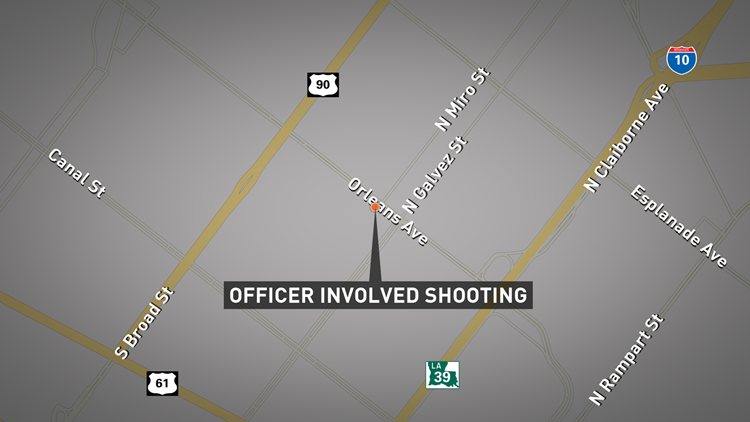 NOPD Superintendent Michael Harrison said that shortly after 10 p.m., officers received a call of a possible suicide attempt at the location on Orleans Avenue near the N. Miro Street intersection. When officers arrived on the scene, they encountered the suspect, who fired and struck the officer in his bulletproof vest. Four officers fired back at the suspect, striking him. The suspect died from his injuries, according to Harrison. Both identities of the suspect and the NOPD officer have not been released by police at this time. Harrison said the Independent Police Monitor and the FBI had been notified, along with members of the consent decree team. "A formal investigation has been initiated," said Harrison, who added that body camera video was already being reviewed. NOPD's Public Integrity Bureau (PIB) is also investigating the incident. The three other officers who were on the scene have been reassigned while the investigation is ongoing, as per protocol, police said. Mayor LaToya Cantrell was also on the scene and credited the bulletproof vest with sparing the officer's life. "That vest saved his life," she said. "His wife, his mother and aunt are with him at the hospital." Harrison referenced officer training and crisis intervention training for knowing how to handle and de-escalate life-threatening mental health situations. "There are split-second decisions that have to be made. This very well may have been one of those times," Harrison said. The shooting is under investigation, Harrison said. Cantrell added that the officer would be ensured the supportive services he needs to recover. This is an ongoing report. Stay with WWL-TV and WWLTV.com for the latest information and updates.